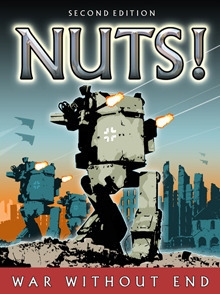 Weird WWII: "Nuts! War Without End"
My pal JC just finished writing his fantastic Weird WWII rulebook for Ed’s WWII rules set, NUTS! The rulebook is about all you need to start gaming on the deadly battlefields of WWWII and covers everything from actual prototype weapons to super-tech stuff like walkers and robots. The rules also include how to make your own WWWII vehicles and field supers and also comes with several scenarios to try it all out with. So if you are in need for an all encompassing Weird WWII rulebook that allows you to game the way you want then this is it it. You can read a more detailed description of its contents here. I also have it on the down-low that this is the first in a trilogy of Weird WWII-themed rulebooks so keep your eyes peeled for future insanity from the mind of of this WWWII genius.